The York Gyrocopter Experience is a flying lesson in a Gyrocopter around York which lasts around 30 minutes. Before the flight there will be a short introduction to Gyrocopters and a safety briefing. The introduction may be done as part of a group of like-minded people, whilst lessons are always flown one-to-one with a Flying Instructor. During their flight, our trainee pilots will sit in the pilot`s seat in the front of the Gyrocopter and will have an unrestricted view. The Instructor will sit in the rear seat. Following, take-off student pilots will be at the outskirts of the city and will be able to see the Minster. Skirting around the racecourse, overhead Naburn marina, down the river Ouse and over flying McArthur Glen Outlet Mall there will be a clear view of many York Landmarks. After some hands-on control as Elvington airfield comes into view and they pass over the Monks Cross centre, the Instructor will demonstrate some of the unique flying abilities of a Gyrocopter. Returning to the airfield will provide an opportunity to experience first-hand the gilding capabilities of the Gyrocopter, touching smoothly to the ground as they step out of the sky. 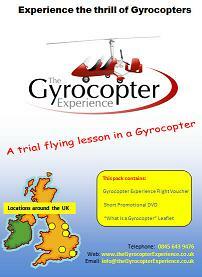 The gift pack includes a voucher for a 30 minute flight around York in a Gyrocopter. Also in the pack is a short promotional DVD which illustrates the excitement of flying in a Gyrocopter, together with a leaflet answering most of the basic questions people ask. Purchasing a gift pack gives you something to wrap up and give to the lucky recipient on their special day allowing them to see for themselves what they will experience. You book a date & time for the flight at your convenience.